Still joined along the sides in the characteristic tube shape, this cotton sarong was made in the small island of Savu in the very south of the Indonesian archipelago. The upper section was folded over when worn. The deep blue ground is decorated with horizontal stripes of different widths containing white ikat motifs drawn on a red ground. The embroidered guard stripes are a typical feature of Savu sarongs. – Good condition. This pile-woven cushion is still joined along the sides. The mosaic-style diamond design is identical on the face and back. The small rug was woven by the Beni Jelidassen, members of the Beni Ouarain Confederation who live in the north eastern Middle Atlas region. – Slight signs of age and wear, good overall condition. This pile-woven cushion displays a mosaic-style basic design of small rectangular compartments in blue, dark red, orange and a greenish beige. Its lower section is overlaid by two large diamonds, and above these it changes to a composition of diamonds. The small rug was originally folded across the centre and joined along the sides for use as a cushion. 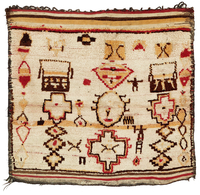 A rare weaving of the Beni Jelidassen tribe, members of the Beni Ouarain Confederation, it was made in the north eastern Middle Atlas region. – Slight signs of age and wear, somewhat reduced at the top, good overall condition. A nomadic people in the past, the Zemmour Berber tribe now live a sedentary life in the region between Rabat and Meknes in north western Morocco. The skill of the Zemmour weavers is particularly evident in their women’s wraps known as "tahddun", made from wool, cotton and silk and often amazingly fine in weave. They always show horizontal stripe designs incorporating delicately patterned bands. The captivating feature of this wrap immaculately woven with a great love of detail is the precision of its small-pattern stripes. The white stripes are embellished with dainty brocaded motifs. In addition, very narrow knotted rows have been inserted. – Slight discolouration, good condition. This large cover is probably a weaving of the Beni Mtir Berber tribe who live in the north western part of the Middle Atlas south of Meknes. It was not intended for everyday use, but constitutes a prestige textile kept for special occasions and esteemed guests. The cover has been produced in a mixed technique of flatwoven and knotted sections. It is reversible with a different appearance on either side. The knotted sections – varying in ground colour and width and with a pile so high and shaggy that the design is only discernible on the reverse – have been superimposed in a three-layered lattice on a kilim ground of horizontal stripes, where two colour combinations (red-and-olive and aubergine-and-blue) alternate in a regular rhythm. The interplay of different colours, textures and designs and the strong contrast between the empty kilim sections and the densely patterned, knotted bands have produced an abstract picture of impressive complexity. – Good condition. Inhabitants of the western Middle Atlas region, the Ait Sgougou Berber tribe are well known for their large-format, almost invariably red-ground carpets featuring empty fields. In this rather finely woven, high-quality example, the light red field is framed at the sides by a narrow border of blue points. Wide kilims of horizontal stripes in diverse pastel shades provide the end finishes. – Good condition. Coarsely woven and loose in structure, this rug was probably made by the Zanaga, a Berber tribe who live in the Anti-Atlas region bordering the Sahara. It presents an astounding, purely abstract design of rectangular sections and spots in black-brown, white and various shades of grey, resembling a mixed-up chessboard of displaced and distorted squares. Spontaneous and haphazard in effect, the composition invites comparison with some pictures of European "Informalism", a movement within modern painting known by that name since 1951. – Slight signs of age and wear, good overall condition.